Well we did it. Thanks to Josh Shepherd at Digital Elite we have a brand new website and blog. The blog is incorporated into the website and can be accessed from the home page at www.jeanstockdale.com. I hope you will stop by often. My purpose in blogging is to encourage MOMS in the fine art of Christian mothering. And let's face it, mothering ain't an easy gig!!! 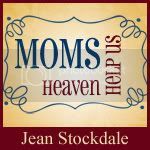 So for a regular dose of encouragement and a liberal sprinkle of sanctified humor, join me over at www.jeanstockdale.com. I hope you will drop by for a visit soon. Blessings. At the end of this month I will be closing down this account. Which is slightly sad since I have been blogging here since 2006 I think. But I have me a new fancy dancy website about to launch and the blog is built right in it. That's what I'm saying! We think it will go live on Monday but that leaves enough time for the wheels to come off that bus, so we will see. I will post my new address on this blog as soon as that one is up and running. Thanks for checking in with me. Blessings. In Eccessiastes Solomon wrote, Dead flies make a perfumer’s oil stink, so a little foolishness is weightier than wisdom and honor (Ecc. 10:1). That is, when dead flies are discovered floating in a vat of perfumed oil, the whole batch is ruined! Dead flies give, even a vat of concentrated perfumer’s oil, a bad smell! And it only takes one or two flies in the ointment to spoil the sweet fragrance of the perfume and most is worthless. Likewise, in the body of Christ, one or two malcontents can spoil the fellowship and stink up the place! In the midst of the sweet aroma of a united fellowship, striving to fulfill the purposes and plans of God, a fly can spoil the ointment! Division among believers spoils intimacy in fellowship, shakes the faith of new converts, damages the cause of Christ to the unbelieving world, and breaks the heart of God. At the church of Philippi, Paul was aware of a fly in the ointment. Epaphroditus brought word to Paul of the conflict between two women in the congregation, Euodia and Syntyche. Paul urged the two women to reconcile their differences and live in harmony in the Lord (Phil. 4:2). Can you imagine what it felt like to be one of these two women? In a letter that contained no rebukes, no correction of doctrinal error, or reprimand for moral failure, in a letter that consists of positive encouragement to press on in the Lord, in a letter intended to be read publicly to the congregation, can you imagine? Can you imagine hearing your name announced as one of the two flies in the ointment that was spoiling the fragrance of Christian harmony? Just how much was holding on to that grudge worth to those two women? We do not know the details of the disagreement but I don’t think it was worth what it cost them. Mercifully, the reference to Euodia and Syntyche was brief. Much was left unsaid causing me to fear that the details were well known to the congregation. Paul’s gentle plea for unity is immediately tied to joy. These two women had lost the joy of Jesus. Rejoice in the Lord always; again I will say, rejoice! Let your gentle spirit be known to all men. The Lord is near! (Phil. 4:4-5). The joy of the Lord produces a gentle spirit. Joy. Gentleness. Fruits of the Holy Spirit. That is the testimony the Christian world should be known for, not bickering and in-fighting! Until Jesus returns, may we be found faithfully serving Him - refusing to become a fly in the ointment of Christian unity within the body of Christ. Just something to think about! Blessings. Despite the over abundance of words that I have and in spite of my natural dsire to share them all, I have reduced my life summary of this week to six short words. My head's spinning. Make it stop. Linked to Six Words Sunday. After a busy week with no time to blog, I thought I might put life on pause and dash off a post. I will be speaking in Dalton, Ga. at Grove Level Baptist Church on Friday and Saturday and in Atlanta at Burnt Hickory Baptist Church on Sunday during the Sunday School hours. If you are anywhere near by, please come and join in the big large fun that we are gonna have. Because when God shows up and shows off . . . it is always big fun! I'm just saying. I am teaching through the book of 2 Timothy. What a rich book! You can study along with us and watch the DVDs of the messages by clicking here. I am working on a new book on the Old Testament story of Ruth. I dearly love her story. I am thinking of entitling it "All the Single Ladies." Just kidding. Anyways, I love her life message of a God that is sovereignly in control and actively at work in the lives of very common people. Gotta love that. We are going to be launching a new website for our ministry, Standing Near the Cross. And whoa baby . . . it is quite the deal. Technology is a wonderful thing for those who know what they are doing. For the rest of us, it is best if we don't get all up in it - all willy-nilly. The new website will allow us to enlarge our reach and enhance our purpose, which is to encourage and inspire women to follow after Jesus. We need to live this faith thing out-in our humanity-and we need lots of support and encouragement as we go. So, even as life threatens to overwhelm and overtake me at times, I remain firmly rooted in Christ, my King. Blessings. The SECRET, the real SECRET to living the victorious Christian life is directly connected to studying the Word of God in order to renew the mind. Your unregenerate brain accompanies you after your conversion. You mind was trained in depravity and you take it, with all the sinful habit patterns in tact, into your new life in Christ. The mind is not automatically regenerated-THE HUMAN SPIRIT IS! The Holy Spirit take up residence in the quickened human spirit, but the soul remains trained by the habit patterns developed in your lost condition. It has the potential of being transformed progressively, but that comes through the study of the Word of God and the washing of the Word. When God's truth is then mixed with your obedience and dependence upon the Spirit of God, the life begins to be transformed into the likeness of Christ. Beloved, that is THE SECRET. Pass it on! On March 7, 2010 I will be at Burnt Hickory Baptist Church near Atlanta, Ga. I will be speaking 2 times, during the Sunday School hours, to the women of the church. Each message will be different. If you live in the area, join us here. Bring the family and make plans to stay for the worship service. Let me know if you are coming so I can make sure to meet you! Blessings. 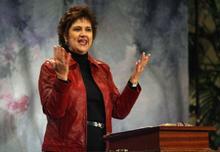 I am headed to Grove Level Baptist Church to speak at their Women's Retreat March 5-6, 2010. I will speaking on the topic "Restoring Your Spiritual Passion." Are you feeling a little rundown in your spiritual life lately? Could you use a good dose of inspiration and encouragement? Would a good ole laughing fit do you some good? Would you like to be surrounded by a group of like-minded women? Do you live anywhere near Dalton? Great. Come on and join us. For more information or to register click right here. Let me know if you are coming and I will look for you! If you cannot join us, this "Restoring Your Spiritual Passion" 3-CD set of messages is avaiable here. After I speak at Grove Level I am driving to Atlanta and on March 7, 2010 I will be at Burnt Hickory Baptist Church near Atlanta, Ga. I will be speaking 2 times, during the Sunday School hours, to the women of the church. Each message will be different. If you live in the area, join us here. Bring the family and make plans to stay for the worship service. Let me know if you are coming so I can make sure to meet you! Blessings. In March we are launching a new website for my ministry, Standing Near the Cross Ministries. I am a Christian author, Bible teacher and speaker. My website is used to manage my speaking ministry and the bookstore for my Bible studies and DVDs. I have written 7 Bible studies with accompanying DVDs (and CDs) for personal use, small group discipleship, or church ministries to MOMS. My current website will remain active until the new one is launched in March. My blog will be incorporated into my website (I can hardly wait!). This Typepad blog will remain active until April 2010 and then will be replaced by the new one. I will post the new blog http as soon as it is available. I hope you will make note of my change of address and continue to connect with me! The new site will offer some great new options for us to enlarge the reach of our Ministry to Moms all over the world. We will soon be offering e-books on topics such as Biblical discipline, training your child up in the way he should go, Bending the Twig without Breaking the Branch, Teaching Children about God, Becoming a Student of the Word of God, From the Profound to the Practical, Faith-Walking for Moms, Growing Godly Women, How did the Virtuous Women Get So Much Done, What a Girl Wants, and 1000 (more or less) other topics! We will also be doing short videos to encourage and inspire you to become a godly woman. We will offer down-loadable study notes for our Bible studies and podcasts. The new site will have a great calendar to let you know when and where I will be traveling and speaking. You will be able to get all the details to come and join us. AND we will have a newsletter. You will be able to register for it and receive a monthly devotional to urge you on in your faith-walk with Jesus Christ. We will also have information on how you can start a Ministry to Moms in your home or in your church. Our purpose is to strengthen the home by encouraging women in the fine art of Christian mothering. Our new website will allow us to reach more moms with inspiration from the Word of God-taking the profound truth of the Word of God and making it practical for daily living. To God be the Glory. Great things He has done! Dear moms, it is incumbent upon us to live out this thing called faith. Our children need to see what faith-walking looks like. Christ, clothed in our humanity. In the kitchen. In the den. In the midst of crisis. In the monotony of the mundane. In times of joy and walking through the valley of the shadow of death. We need to parent out of the overflow of our devotional life and love for the Lord Jesus Christ. We live on ten acres in a rural part of Fayette County. We own a landscaping business, and Craig uses our property to grow a lot of his nursery stock. He has a metal building on the back corner of our property for his office and shop. Our dear family friend, Renae Terrell, works for us in the office. Our property is bordered on two sides by fields that lay dormant. Each year, several hundred acres around us sprout a healthy crop of what we call broom straw. Broom straw is a tall dry brittle grass that is highly combustible. Several years ago I had lain across the foot of my bed with a sick headache. It was late afternoon, and I had taken some pain medicine and hoped to sleep off the effects of my throbbing misery. I was somewhere between deep sleep and lapsing into a coma when I become mildly conscious of the fact that my friend Renae was calling my name. Startled, I cracked one eye open to see if I was dreaming or if my friend was, in fact, standing over me. Yes, that was my friend all right. Renae was speaking to me in a very low and strangely controlled tone of voice. She was carefully measuring her words. “Jean,” she said. “I don’t want to alarm you, but the field is on fire and it is heading this way!” I did not immediately grasp the meaning of the words she spoke, but I could not help but notice that she was now screaming in my ear and hopping from one foot to the other. Even in my heavily medicated state, I could tell that meant trouble! “What did you say?” I managed to groggily reply as I pulled myself upright into a sitting position. “Fire!” she screamed. Now I was fully awake! We both ran out the kitchen door to the back of our property. The field behind us was engulfed in flames and it was rapidly moving towards our property. We watched in horror as tongues of flames lapped up the broom straw, silently fueling the fire and feeding its fury. Renae and I could see a fire truck on the far side of the field and our faithful volunteer firefighters feverishly working to limit the damage and contain the fire. Suddenly we were aware of heavy equipment coming up my driveway and rumbling across our property to approach the fire from a different direction. The flames were now only 10 feet from our fence line. In no time, the heavy tractors were unloaded and used to make dirt fire walls, surrounding the fire and cutting it off from its source of fuel. Thankfully, the fire was quickly brought under control and the flames were soon extinguished. Fire can be very useful. However, fires must be carefully tended. Too much fuel can lead to wildfire. Too little fuel can reduce a flaming fire to a pile of glowing embers. In 2 Timothy 1:6 Paul wrote, For this reason I remind you to kindle afresh the gift of God which is in you through the laying on of my hands.As believers we are in danger of wildfire-that is falling victim to a counterfeit move of God, fueled by Satan and fraught with doctrinal error. On the other hand, we are in danger of failing to feed our devotional love for the Lord Jesus and reducing our passion for the things of God to smoldering embers. Paul urges us to continually fan the flames and stir the embers through personal Bible study, prayer, Scripture memorization, and other disciplines of the faith. In order to pass the baton of the faith to the next generation we must kindle afresh the gift of God. Blessings. Heat oven 425 degrees. Melt 2/3 stick butter in 13 x 9 pan. Pour mixture immediately into hot 13 x 9 dish. Bake for 15 minutes. Dust with powder sugar and serve with syrup or honey. This is a recipe my boys especially loved when they were little. Enjoy. Linked to Blessed with Grace and Balancing Beauty and Bedlam and All the Small Stuff. Bellevue Baptist Church in Memphis, TN. is hosting a Downline Women's Summit Feb. 19-20 featuring teachers and authors such as Kay Arthur, Dr. Rene Rochester, Carolyn McCulley, Jani Ortlund, Cheri Holcomb, Donna Gaines, & more and special music by Lisa McClendon. These key note sessions and workshops will be taught by respected teachers and authors such as Kay Arthur, Dr. Rene Rochester, Carolyn McCulley, Jani Ortlund, Cheri Holcomb, Donna Gaines, & more and special music by Lisa McClendon. For more info on the Downline Conference click here or to get information about the conference at Bellevue Baptist Church click here. So, let me sum up my day in six words. I am overwhelmed by God's grace. Blessings. Linked to Six Words Saturday.